Prime Minister Modi commended their dedication towards education and for making it their life mantra. He said that a teacher remains a teacher throughout life. During the interaction, the Prime Minister urged the awardees to mobilise the community and to make them an integral part of school development. He also exhorted the teachers to work towards bringing out the inherent strength of students, especially those from poor and rural background. He also encouraged the teachers to digitally transform their schools and its neighbourhood. 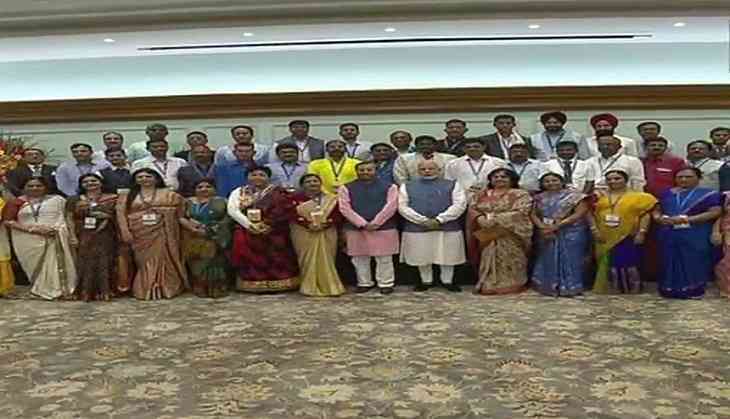 Interacting with the Prime Minister, the awardees narrated their inspirational stories in transforming their schools into centers of learning and excellence. They also thanked Prime Minister Modi for the new online nomination process and schemes like Digital India, which is bringing a big qualitative change in school education throughout the country. The Union Minister for Human Resource Development Prakash Javadekar was also present on the occasion.